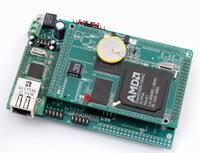 The P52 is an I/O expansion board supporting high speed 16-bit parallel ADC and DAC. The P52 has 16 sourcing drivers, or 14 sinking drivers (ULN2003), 8 Opto-couplers, 2 quadrature decoders and additional 24 bi-directional TTL I/Os(82C55). Fast Ethernet Module can be installed to provide 100M Base-T network connectivity. Measuring 4.4 x 3.1 inches, the P52 is an I/O expansion board designed for and driven by a Tern host controller. A 16-bit external data bus is required to run the parallel ADC and DAC on the P52. It supports four 16-bit, parallel DACs (DAC8544) buffered by 4 ops with gain=2 (hardware adjustable), providing analog output by default. A resistor pot is used to adjust the DAC analog output offset. It also supports eight 16-bit parallel ADC inputs (AD7655). The P52 buffers PIOs with 16 sourcing drivers (UDN2982), or 14 sinking drivers (ULN2003). These drivers can source or sink 350 mA at 50V per line to directly drive solenoids, relays, or lights. Eight Opto-couplers (PS2701, NEC) can be installed to provide optically isolators to PIOs. 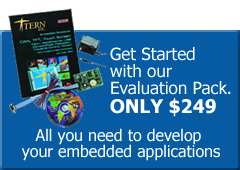 Two quadrature decoders, (HCTL2020) can be installed to interface incremental motion encoders. In addition, 24 bi-directional TTL PPI I/Os (82C55) are software programmable and free to use. A 100M BaseT Ethernet controller (Wiznet) can be installed to provide network connectivity. A software stack library is available, supporting network protocols like ARP, DHCP, UDP, ICMP, and of course TCP over the Ethernet network. Two channels of RS-232 drivers and a 5V linear regulator are on-board. An optional RS232 or RS485 driver can be installed for the optional 3rd UART of the host controller. The P52 requires 8.5V to 12V DC power supply with linear regulator, or up to 30V DC power input with an optional switching regulator without generating excessive heat. 10M Ethernet(P50) or 100M Ethernet(P52). 16-bit DAC8544 provides 4 analog outputs.